Nothing like a National Scrapbooking Month and a challenge to get me to post scrapbook layouts. Really it's long overdue for me to get back into scrapbooking and scrapbook all the wonderful photos that I've already organized. It warms my heart to see the faces of my little ones as I scrapbook. They're all grown up now and in college with my last baby in high school. These are really old CTMH supplies that I used. I created the background on the top portion with the sentiment by stamping. Lots and lots of stamping. The butterfly was done using a stamp rolling technique to create the two tone effect. I fussy cut all of the stamped images. I then added the string and spiral clip to finish off the page. Supplies: CTMH - all are retired. 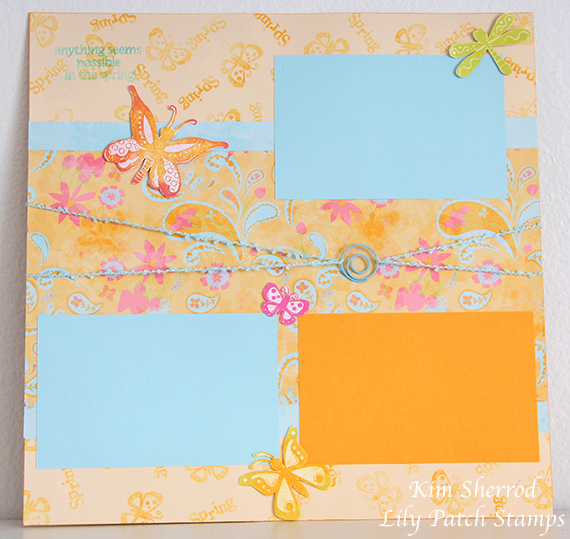 A beautifully bright and cheery creation Kim, many thanks for joining us at Stamping Sensations challenge. A fabulous creation, Kim! great colours Thanks for joining us at Stamping sensations this month! Gorgeous colours and such a lovely layout. Thanks for joining us at Stamping Sensations.